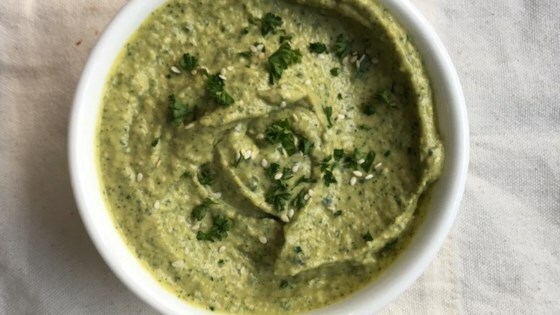 "This simple, basil-spiked 'green' hummus is a great summer twist on everyone's favorite spread. Turkey on wheat? Yawn. Turkey on wheat with green hummus? Hello! And don't even get me started on wraps. I won't even touch a wrap that doesn't contain hummus, and neither should you." Bring a large pot of water to a boil; add the basil and cook uncovered until bright green, about 20 seconds. Immediately plunge basil in ice water until cold. Squeeze basil to remove excess moisture and pat dry with a paper towel. Put basil, garlic, lemon juice, 1 tablespoon olive oil, garbanzo beans, and white beans, salt, and black pepper, respectively, in a blender. Cover and blend until almost smooth; add remaining 2 tablespoons olive oil and puree until smooth. This super-easy homemade hummus stars beautiful fresh basil. Better as a sandwich spread than a dip. I've made this several times. We love it just as is. The whole family loved it! It was too thick for my blender but once I added an extra tablespoon of lemon juice and about 1-2 tablespoons of water it was fine. Heavy on the garlic....and I love garlic. But tasty on veggies!